Tom Ehman and That Trophy. 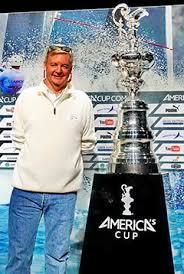 Turns out Tom Ehman is refreshingly candid about what’s happening with the next America’s Cup. As he gears up for his 12th straight campaign, Tom has serious questions about taking the competition to the small island nation of Bermuda and he was willing to share those questions with nearly 100 people who turned out for the AYC monthly meeting on Tuesday, March 10. And Bermuda? What a shock that was when the AC announced it was skipping a return to San Francisco, ignoring an invitation from San Diego, and planning to race the 35th AC on a 20-square mile island in the Atlantic, population 65,000. Tom has run a gauntlet of roles since he started with the Cup in 1980, including rules advisor, team executive, event manager, and chairman of the Challenger Commission. For the past four campaigns, Tom has been Head of External Affairs for Oracle Team USA and the AC spokesman for the host Golden Gate Yacht Club. He’s Vice Commodore of GGYC. His official bio describes him as a former collegiate and North American sailing champion, winner of the 1976 Championship of Champions, and at age 25 the youngest-ever Executive Director of the USA’s national sailing association – indeed, the youngest of any national governing body for an Olympic sport in America. He is the only person of long-standing involvement in the Cup who has worked only for American campaigns−New York YC, San Diego YC, St. Francis YC, and now Golden Gate YC. Here are pictures taken by Chris Smith (except the one of Chris that Tom took).